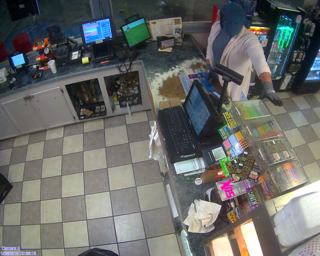 The Calcasieu Parish Sheriff’s Office responded to a call of an armed robbery of a convenience store in the 1900 block of Sam Houston Jones Parkway in Lake Charles this morning around 12:40. The investigation revealed a man went into the store with a firearm and demanded money from the clerk. After obtaining an undisclosed amount of cash he fled the store on foot in an unknown direction. The suspect is described as a man wearing what appeared to be a white bathrobe, blue shirt, gray sweatpants, and gloves. He also covered his head with what appeared to be a blue towel. 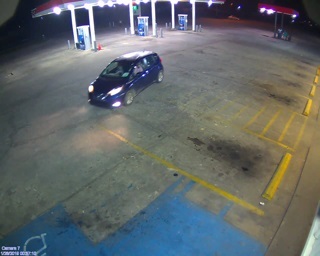 Detectives would also like to speak with the person driving the blue Nissan Versa seen in the attached photograph. It is possible they may have seen the suspect. If anyone has any information regarding this robbery, please contact the Sheriff’s Office at (337) 491-3605. CPSO Casey Lafargue is the lead investigator on this case.